History, helicopters and gob-smacking views on a full-day tour to Port Arthur and the Tasman Peninsula! Make sure you get to bed early the night before! Our friends from Tours Tasmania will be picking you up from your Hobart accommodation at 7:30am to whisk you out of the city and towards the South East of Tasmania. A stop at Pirates Bay lookout is going to astound while a coffee up there from Cubed Espresso will have you buzzing for the day ahead. On to Waterfall Bay, we take a look at some of the remarkable coastal rock formations. On to your helicopter which is now ready to depart. 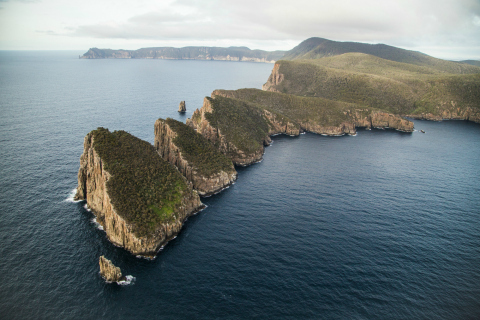 This 15-minute scenic flight takes high above some spectacular coastal scenery, Three Capes Track and the Port Arthur Historic Site. All delivered a dose of knowledge and banter from your complimentary pilot (no sorry, you can't take them home with you..). We pick you up again and now take you to the World Heritage Listed Port Arthur Historic Site for 3 hours of your own time to explore the beautiful grounds, buildings and stories. Are you ready to go home yet? A bit of a chocolate hit at Federation Chocolate will help you through the afternoon drive back to Hobart and a brief stop at Richmond - another famous Tasmanian historic site.